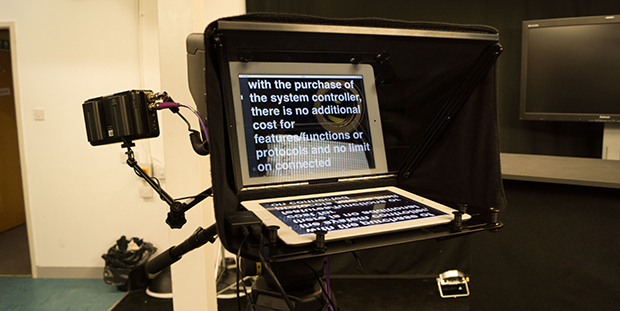 The Portaprompt Tablet Prompter is a nifty mounting system that allows you to place a tablet on the front of your camera and use it as a screen for your teleprompter. 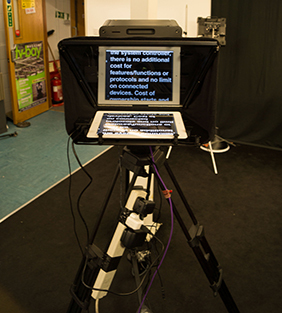 Recently, I was using it in a studio set up to film some product demonstrations - using an iPad. I was impressed! The system has a 12’’ piece of glass reflector for wide angle lenses and is designed for use with DSLRs or other small cameras. Rigging the unit in the first place is pretty easy - demonstration videos are available on the Portaprompt website and it doesn’t take long. The hood can be folded in half for easy transport, and when putting on the shroud fabric - it just velcro’s around the hood which I found nice. The glass is nice and easy to read from - the iPad screen was bright enough for everything to be clear. The hood system has a universal mount on the back which allows you to attach it to camera bars or mini camera mounting plates. The bottom of the unit has a few tracks cut out of the metal, with thumb wheel ‘bobbins’ that you tighten to secure a device. This means that you could use a phone, or any size tablet really - just place it on the base plate, and adjust until it’s secure. Quite cool! picoPrompt was our app of choice for running on the iPad. 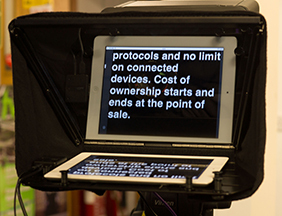 I’ve previously heard of iPad prompting apps such as ProPrompter that accept control from an iPhone, which sounds awesome. Instead however, we used the iScroll hand control - a little controller connected to the iPad through an iGlue prompt adapter which worked well. 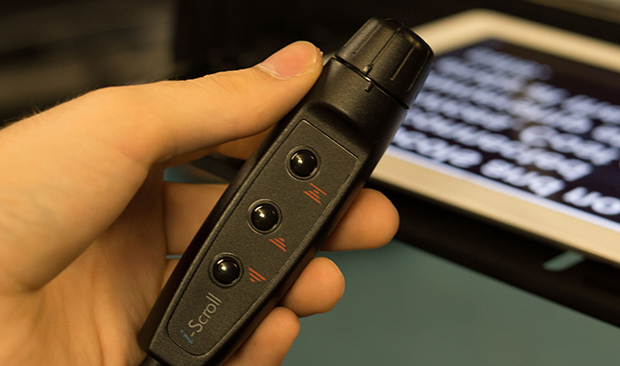 The top of the iScroll has a little ring that you twist to make the text scroll faster or slower - it fits nicely in your hand and comes with a nice long cable - meaning either your presenter, or separate operator can control it easily. 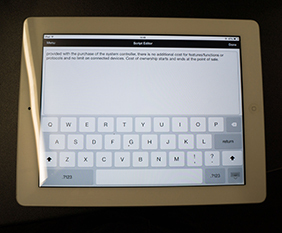 Getting the text onto the app in the first place needed a bit of thinking - I’m not great with an iPad keyboard, so we wrote up the script on a laptop, emailed it to the iPad and then copied and pasted it in. It became a bit fiddly when we wanted to make changes. Something like integration with google drive would be a cool feature in the future. Overall, the unit is extremely portable and works well! It’s very lightweight and you can get Portaprompt’s foamed hard case too - which stores everything nicely. For a shoot where your kit needs to be packed up quickly and not take up much space - it’s perfect.